At Easyweb we believe that technology can create stronger, more engaged communities by enabling people to collaborate, socialise, trade, transact, play, and work smarter. We enable our clients to transform visitors, customers and citizens into smart connected communities by building innovative, reliable and simple to manage networks that provide insights about the people using them. 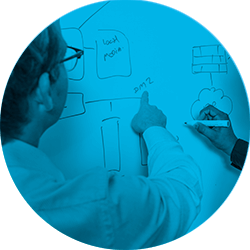 We work with clients to design innovative reliable solutions that produce real outcomes. Our technical experts present detailed concepts to our clients so that they know exactly what they are getting. And our solutions are always flexible and scalable because we understand that both client requirements, and the technologies that address them, grow change over time. 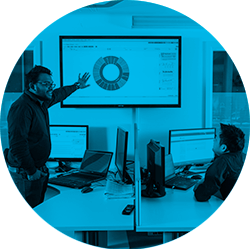 Whether it’s a small or large project, we apply project management principles to all our network builds to ensure timely, cost-effective delivery. We maintain a core of experienced project managers and installers and subcontract to accredited suppliers where necessary. Easyweb operates a comprehensive OH&S system to protect the well-being of our staff, contractors, customers and the public. We love to provide end-to-end solutions that allow our clients to get on with their core business. 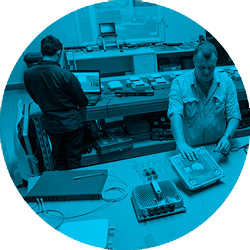 So we provide comprehensive monitoring, maintenance and support services for all of our networks from our Network Operations Centre in Collingwood, Victoria. The NOC is staffed 7 days a week from 8.00AM to 8.00PM to resolve issues for clients and end users. City of Palmerston employ Easyweb to migrate and manage the Library, Recreation Centre, Arts Centre, Civic Centre and Goyder Square systems using the Encapto Public WiFi platform. City of Melbourne elects Easyweb to provide and manage a Public WiFi system for Yarra Edge Marina and River Homes Marina. The system is monitored and controlled using the Encapto platform. Tourism Central Australia picks Easyweb to deploy an innovative through-the-glass touchscreen technology solution for the Alice Springs Visitor Information Centre. The system displays their website information and booking services 24/7. Ramada Suites Zen Quarter select Easyweb to upgrade its core and access networks which support the existing voice, CCTV, core hotel and guest WiFi applications and new high definition smart televisions. Easyweb wins tender and is commissioned to deploy the first ever 10 Gbps radio link in Australia, for Horsham Rural City Council. Groset selects Easyweb to deliver a high speed radio link between their Thornbury and Rialto corporate offices. The NEC iPasolink iX is used to power 100 Mbps full duplex over the 9.5 Km radio link which operates in the 18 GHz band. Easyweb begin a partnership with Hitnet to deliver secured free WiFi hotspots for their indoor and outdoor Community Hubs Network across Australia. These hubs are location and culture-specific, used to reach and engage marginalised communities. Easyweb develops an IoT application using Libelium sensors. City of Darwin selects Easyweb to design, install and manage a Public WiFi system for the recently redeveloped Parap Pool. The system is installed in December 2017 before its reopening. Alice Springs Desert Park chooses Easyweb to deploy an Encapto managed Public WiFi system for key locations within the park. Easyweb installs and commissions Mount Buller to Mansfield 31 KM high capacity radio link. Easyweb designs and installs a WiFi system for City of Darwin’s Nightcliff Precinct. The Encapto platform allows its users ease of access to location specific digital information such as maps, retailers and useful resources regarding the area. Public WiFi is rolled out by Easyweb for Uluru-Kata Tjuta and Kakadu National Parks. Easyweb deploys Public WiFi at the Irruntyu Community in Western Australia. Easyweb becomes a licensed carrier, enabling us to offer fully owned and operated communication networks of any kind. Easyweb’s WiFi platform business is packaged as a globally resalable product and the business is separated as Encapto. Easyweb rolls out public WiFi across the Cairns CBD and waterfront for Cairns Regional Council. 500th site added to Easyweb's managed network portfolio. City of Darwin select Easyweb to supply the Darwin Bus Network with a mobile WiFi system for passenger devices. City of Cairns chooses Easyweb to deploy a user-friendly WiFi service for staff and visitors at the eight Cairns Regional Library sites. Work begins on a system that will manage Easyweb’s growing portfolio of WiFi sites from a single platform. The system will later become Encapto WiFi. Easyweb wins contract with Brisbane City Council to expand public WiFi to 23 parks locations across the city. We move to new premises in Langridge Street, Collingwood. Easyweb installs first trial public WiFi site at the Brisbane Botanic Gardens on behalf of Brisbane City Council. The company is incorporated as Easyweb Digital Pty Ltd.
First smart spaces installations including interactive screens at Geelong football stadium, Vodafone Sydney and the MCG. Company takes on its first employee and begins trading as Easyweb Kiosk, expanding the internet kiosk business to sites across Australia. Darryl Clarke installs first coin operated Internet kiosk at the St Kilda Backpackers.